Hospital business development director Jutaporn Huyakorn presents specially tailored shirts, which students can put on and remove themselves, to Father Ray Foundation Vice President Rev. Michael Picharn Jaiseri at the Redemptorist School for Persons with Disabilities. 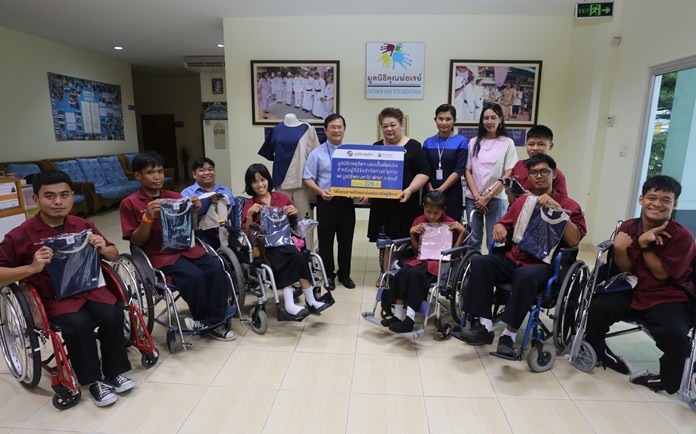 Bangkok Hospital Pattaya donated 226 specially tailored shirts to the Redemptorist School for Persons with Disabilities that students can put on and remove themselves. Hospital business development director Jutaporn Huyakorn presented the clothing to Father Ray Foundation Vice President Rev. Michael Picharn Jaiseri at the school Aug. 22. The shirts are made in such a way that those with disabilities or non-functional limbs can dress themselves. This increases the wearer’s self-confidence, as they are less dependent on others, Jutaporn said. The shirts also are ideal for bed-ridden patients, as they are made of non-irritating fabric and can be changed without much effort. The donation was funded by the Vejdusit Foundation.